A slight movement caught my eye and pulled my attention from the computer screen to the window. From my office I watched a small girl sneak toward the pond. A grin split her face as she pointed into the water to show her nearby parents something. One more step is all it took. I watched the splat a jumping bullfrog made to escape the child's clutches. Both the girl and her parents laughed as they walked along the pond's shore. The scene is repeated several times every day as visitors walk around the Indian Creek Nature Center's constructed wetland wastewater treatment system. In the two years since it was built, the wetland has become the most visited place on the 210 acre facility. That's not surprising. Water is a people magnet, and the wetland's plants are a constantly changing splash of color all spring and summer. The system does more than attract people. It has become a haven for mallards and wood ducks, turtles, frogs, fish, and a wide variety of aquatic invertebrates and diverse plants. Founded in 1973, the privately funded nonprofit nature center is housed in a renovated 1932 era dairy barn that holds exhibits, offices, rest rooms, and a gift shop. Radiating outward is a series of trails that penetrate restored prairies, oak savannas, and riparian forest. Architect Michael Warden supervised construction. In many ways the Center is a victim of success. Although planned for an annual attendance of under 10,000 visitors, more than 40,000 were coming annually by the early 1990's. The tiny septic system was overloaded and functioning poorly. With a mission to enhance visitors' sensitivity to the environment, the last thing Indian Creek needed was a polluting septic system. When we began seeking solutions to our overloaded system we quickly discovered big problems on our hands. 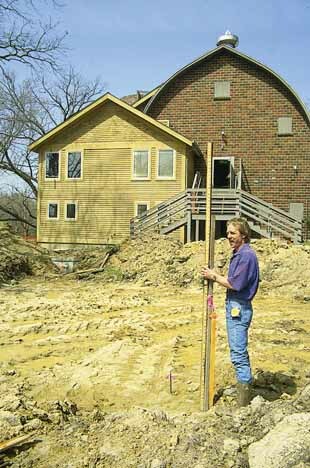 The building is located near the confluence of Indian Creek and the Cedar River in Iowa on a small natural high spot, nearly surrounded by flood-prone land. There was simply no space for a conventional drain field, even if we could find good percolation, an unlikely possibility. The city's main sewer trunk line was close, but nearly 40 feet underground and across the creek. Tapping into it would cost tens of thousands of dollars. Scene of the wetland septic system during the 1995 growing season. A wetland system seemed ideal. I had read about one built in 1989 at The Chattanooga Nature Center. It treated their sewage and became an "exhibit" for visitors. A quick trip to Tennessee convinced me that we had found our answer. But, several naysayers emerged. Small wetland systems were untested in northern climes. It would probably work fine in July, but freeze up come January. And certainly it would smell all summer, they remarked. 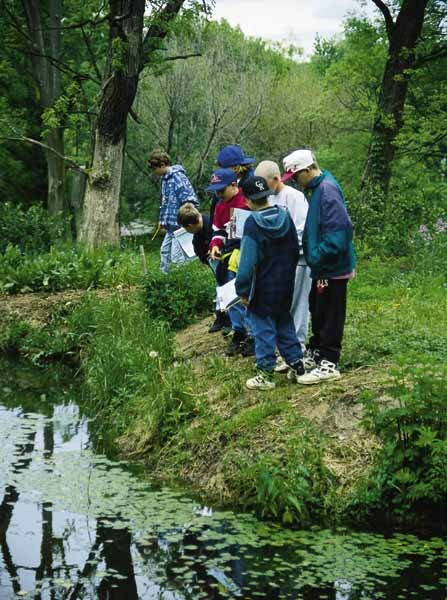 Fortunately, many Eastern Iowans were intrigued with wetland systems, and the right mix of them converged to create Nature Center's model project. Perhaps most critical to the project was engineer Scott Wallace. Shive-Hattery, the engineering firm he then worked for, volunteered Scott's time to design the system. He came with many years experience designing wetland systems. The Greater Cedar Rapids and Hall-Perrine Foundations provided funding, and the Cedar Rapids Parks Department pledged grading work. Members of the Cedar Rapids Garden Club volunteered to purchase and plant a wetland garden once the system was constructed, and various Eastern Iowa businesses either donated or deeply discounted products. The Linn County Health Department and Iowa Department of Nature Resources eagerly provided permits. Architect Mike Warden supervised construction, which began in April 1994 and lasted about a month. The system is simple. Toilet and drain waste flows into a 2000 gallon conventional septic system. Liquid waste flows slightly downhill, through a 4" pvc pipe, into the first of three 800 square foot basins. In the first two, basins dirty water flows through pea gravel. Although no water reaches the surface, wetland plants have their roots in the dirty water. The combined surface area of hundreds of thousands of small rocks and roots forms a massive substrate for the bacteria that break down sewage. Wallace originally planned the system with only two basins, however the Nature Center wanted a pond for beauty, wildlife, and education. There was plenty of room, so an 800 square foot pond was added. Clean water, leaving the second basin, runs through a water control structure in a manhole and into the pond. Water flows, by gravity, from toilets to the pond. Under normal conditions, evaporation and transpiration remove all the water. Only during two massive thunderstorms has water flowed through the pond's overflow pipe and entered Indian Creek. In all ways the wetland system fits with the Nature Center's purpose. People consider sewage to be simply waste. In conventional systems, sewage is out of sight, out of mind. We wanted people to consider sewage a resource, and a wetland system allows homeowners to have both a pond and a wetland garden. It also allows homeowners to build a septic system in places where poor percolation prevents construction of a conventional system. There's no question that the system is interesting and attractive. Two couples have already been married in front of it! But, does it function well, and does it work in the winter? Fortunately, the Cedar Rapids Water Pollution Control Facility is located only a half mile from the Nature Center. A number of employees were personally interested in the system, and Director Dan Rockwell volunteered the use of his staff to collect water samples and his modern lab to analyze them. Collection and analysis was under the direction of Sam Kamhawy. Naysayers have been proved wrong. The system never smells, and it works as well in January as July. As an educational organization, the Nature Center has taken great effort to help visitors understand the wetland system. nformation on the wetland is posted in toilet stalls. While using highly water-efficient Kohler toilets, visitors learn how the waste they flush flows through the wetland. They are invited to leave the building and walk around the basins and pond. 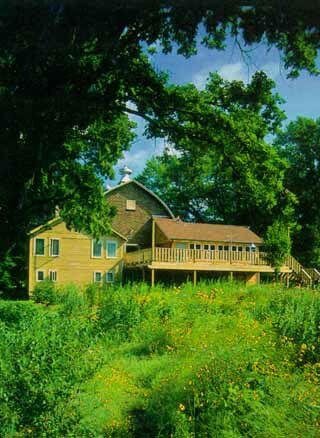 The Indian Creek Nature Center is located at 6665 Otis Road SE, Cedar Rapids, IA 52403. It is open to the public seven days per week. Nonmembers are charged a $1 admission fee. In addition to the wetland system, the Nature center has incorporated extremely efficient lighting, windows, and toilets into its buildings. All are interpreted to the public. ©2004 - 1998 Land and Water, Inc.